For clear insight into the US polypropylene (PP) industry, you need in-depth pricing information direct from the region. ICIS has a network of locally based experts, providing PP price assessments and analysis including a rolling 12 month forecast to support your short- and medium-term decisions. PP supply is expected to remain comfortable on higher production capacity and improved operating rates. Propylene feedstock is expected to be sufficiently supplied and should be attractively priced after a strong run-up in prices during 2018, which should encourage higher run rates on the part of PP producers. PP demand is likely to be fairly steady into the second quarter. Export volumes may continue to rise as sellers target more deepwater markets, especially if high propylene inventories continue to depress prices. Import volumes are likely to decline as import cargoes are no longer competitive relative to domestic material. We offer the following regional Polypropylene coverage to keep you informed of factors and developments affecting prices in the US Polypropylene marketplace. The main method of PP manufacture is by using refinery grade propylene (RGP), produced by a refinery, to convert to polymer grade propylene (PGP) through a superfractionation unit. 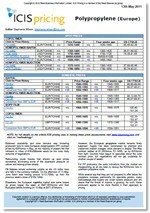 The ICIS Polypropylene (PP) USA price forecast report is a monthly publication that can be accessed via the Dashboard. ICIS has a wealth of information on the domestic US market which can help you in your short- to medium term planning. 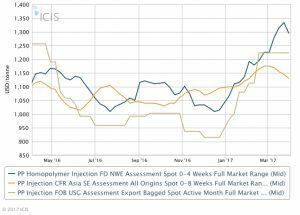 ICIS US Polypropylene price report – a weekly price report covering several grades of PP, including injection, raffia homopolymer, limited film grades and rock co-polymers. It also features price quotes for domestic material sold on a delivered (DEL) basis and export material sold on a free on board (FOB) basis. 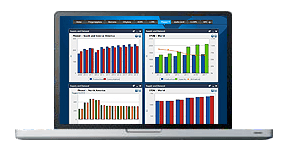 Insights into the various factors influencing prices are covered, such as planned maintenance, schedules and outages. Use this report to understand price drivers and fluctuations, and as a benchmark in settling your contract prices. 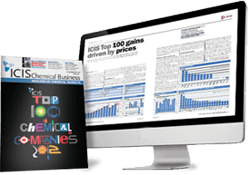 You will be able to access the pricing information online, via the ICIS dashboard service. ICIS Polypropylene (PP) price forecast report – a concise, easy-to-read monthly report that covers current and forecast prices, raw materials prices, supply, demand and capacity information, regional import and export data, trade flow forecasts, and margins. Use our forecast report to gain access to the information you need to see where prices are heading. Whether you are a buyer, producer or trader, the weekly ICIS US Polypropylene (PP) Margin report will help you understand how costs and prices affect product profitability. This report is designed to complement the ICIS US Polypropylene price report by covering several models, including integrated PP production from refinery-sourced propylene, the dominant feedstock for PP production in the US. Other models include integrated PP production from naphtha and standalone (or non-integrated) PP production from polymer-grade propylene. With the growing significance of propane dehydrogenation (PDH) in the US, a theoretical model for integrated PP production from propane is also considered. The models track various market factors, including feedstock prices and business cash costs, giving you a better understanding of market dynamics. They combine ICIS’s benchmark price assessments with plant manufacturing and feedstock yield data provided by Linde Engineering. Understand the various factors driving PP profits and anticipate their impact on your business.